“Santa Claus is really your parents”, she said. My eight-year-old self stomped home from my childhood playmate’s house, stormed into the living room and demanded an explanation from my unsuspecting and caught-off-guard Mother. Duped, lied to, shocked and incredulous – that about summed it up. I wasn’t in on the secret and it made me mad. After some pointed questions, a mix of her intuition and rational thought she figured out that Mom and Dad have kept the magic alive for the Easter Bunny, the tooth fairy and St. Nicholas BUT…”I still believe in Santa Claus.” she said with a knowing smile. Well, we went this far – we were taking it all the way. It was so bittersweet. She marveled at the new information, laughed a little and then the next wave of reality washed over her and with it came some tears. Ouch. She was finally in on the secret. But it’s one of those moments in a child’s life where a layer of innocence is slowly peeled back. It breaks the heart just a little. What’s next? High school graduation already? Thankfully not just yet. But this was just round one! Her older brother still wasn’t in on the secret. A double whammy. A separate conversation ensued at just the right time days later. Techno informed us he’s known for a couple of years. He just didn’t say anything. I think a part of him didn’t want to peek behind the curtain and see the wizard operating the controls. It’s just simply more fun to believe. The timing couldn’t have been more perfect for this all to take place. Because by week’s end we would be sitting in a concert hall, in front of a symphony orchestra playing the score and watching along to the animated short film of one of the most nostalgic Christmas traditions from my childhood. 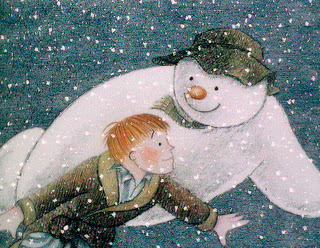 It’s a film based on the book by Raymond Brigg’s entitled The Snowman. I don’t know many people who are familiar with this tale. It always seemed kind of an obscure find that we stumbled upon more than twenty years ago. It’s the story of a young boy who builds a snowman one wintry night only to delight in the fact that he comes alive. The two explore the human world of the boys’ house, the world outside and many of the nearby animals in the countryside and then take flight for a journey to the North Pole, a snowman party with Santa and witness the Northern Lights. In the morning the boy’s new friend has melted with the sun and all that remains in the pocket of his pajamas is the scarf Santa had gifted the boy the night before. In the book there are no words, just pictures. In the movie the only words are those of the gorgeous song “Walking in the Air” sung by a British choirboy. I promise you if you listen to it once, the music will stick with you forever. I’m still humming it four days later! The movie became part of my children’s Christmas tradition starting with Techno’s second Christmas. It was perfect to watch this with both of the two older kids last week accompanied by the orchestra and a local-cast choirboy because it put me right back to suspending disbelief, going with the story as its presented and finding joy in the magic of it all. Ice said to Twinkle after the reveal “We still believe.” She was a little relieved to hear that. I was a little relieved to hear that. And this movie sealed the deal. This link takes you to the You Tube page where you can enjoy this Academy Award nominated film if you’d like (please excuse the Dominos pizza ad or whatever you will be forced to watch for 15 seconds!) It’s 26 minutes in length. Watch it with someone special.